What Do I Need to Know About Regulators? The term “regulator” is usually used in the grill world to describe the regulator, hose and fitting that bring gas from your LP tank and connects it to your grill. The hose connects it to the brass fitting which is the part that screws onto your grill. Right next to the regulator is a collar that twists freely. That’s the part that screws onto the LP tank. Though you should always turn off your LP tank when you’re done cooking or when you’re changing the regulator, LP tanks are made with an automatic shut off valve. It will only work when a regulator hose is connected to it. How do you know when it’s time to replace your regulator? As I mentioned, the regulator brings gas to your grill burners. –If you have low heat coming from your burners when your gas is turned on high, do a visual check on your burners to make sure they are all in one piece and there are no obvious holes or problems. If your burners look good, it’s probably time to replace your regulator. –If your burners light up unevenly, for example, the burner on the far right flickers or hardly lights, the middle burner has low flame, and the left burner has a normal looking flame, it’s time to replace the regulator. –If it seems like over time your grill gets less and less hot. Last week it took 10 minutes to grill some burgers, but today it took 15 to grill the same burgers. It’s time to replace your regulator. WHY? Regulators, for safety reasons, close down slowly over time as they “go bad.” You probably won’t notice one day your grill is perfect and the next it doesn’t light at all. The burner closest to the source of gas will light up better than those farther down the manifold. Your grill will get to lower and lower temperatures over time, even on “high” heat. The main indicator of needing a new regulator is low heat or low flames, especially if it’s getting worse over time. Keep in mind that you may also have a problem running along the hose. Be aware of the smell of gas even when your grill is off or a tiny hissing sound. Some animals like to chew on the sun-baked rubber hoses. (Don’t knock it ’til you try it?) If this is a problem for you, they have invented handy-dandy hose guards. Check them out. If you think there’s a leak, but you’re not sure, you can check the hose with some very soapy water. Rub the suds all the way along the line of the hose. Turn on the gas tank. If there is gas escaping, it will cause the soapy water to bubble at the point of the leak. What are the differences in regulators? A single-hosed, standard regulator is the most commonly used part on grills. It’s the picture I used above. These regulators let out up to 60,000 BTUs of gas. If you have a side burner, you may have a dual-hosed standard regulator. There is one regulator (remember that’s the disc) and there are two separate hoses. Sometimes one hose comes off the regulator and splits into two hoses, forming a Y shape, and sometimes there are two hoses coming directly out of the regulator itself. Either will work and they are interchangeable. If you have more than three burners or a new standard regulator still doesn’t seem to allow enough gas to your grill, you may need a high-flow regulator. These regulators let out up to 90,000 BTUs of gas. It is possible to have your grill be way too hot, so don’t get a high-flow regulator and hose just because you think it’s cool. Usually, the removal and visual inspection of your regulator will tell you which replacement you need. It’s also a good idea to measure the existing hose and/or the space a hose needs to stretch to reach from the tank to the valve or manifold. If you’re not sure, call 877-244-0737. The staff at GrillPartsSearch.com is always happy to help. –A hosed that is crimped onto the valve or manifold in your grill. You will know because you won’t be able to unscrew the hose from your grill. In this case, you need to contact your manufacturer to replace the entire valve system. –A hose with a male fitting on the end that connects to the grill. –A hose with a fitting larger or smaller than a 3/8″ flare, which translates to about a 5/8″ inner diameter measurement of the opening at the end of the fitting. You can’t measure the 3/8.” It’s confusing, I know. Like I said, check for a 5/8″ measurement. The good news is that this can be the easiest, cheapest part of your grill to fix! Not all regulators are created equal. If the rubber is lower quality, it may break more easily once it’s been in the sun for a while. A lower quality regulator can go bad more quickly. Visit GrillPartsSearch.com’s profile on Pinterest. This entry was posted in Basics, Frequently Asked Questions, Parts, Your Grill and tagged animals, burners, crimped, disc, diy, dual, female flare fitting, fitting, gas, gas grill, grill, grill parts, grill replacement, high-flow, hose, leak, liquid propane, low flame, low heat, LP, manufacturer, natural gas, NG, regulator, replace, replacements, rubber, single, spring, temperature, temperatures, uneven by Grill Girl. Bookmark the permalink. and how can I find them? I have a Bakers & Chef grill Model MEV808ALP. The replacement according to the owners manual call for a 2 stage LPG regulator. The one you offer is a single stage. Will this work and what is the difference? Sorry for my late response, Tony! I was out of town at a conference. 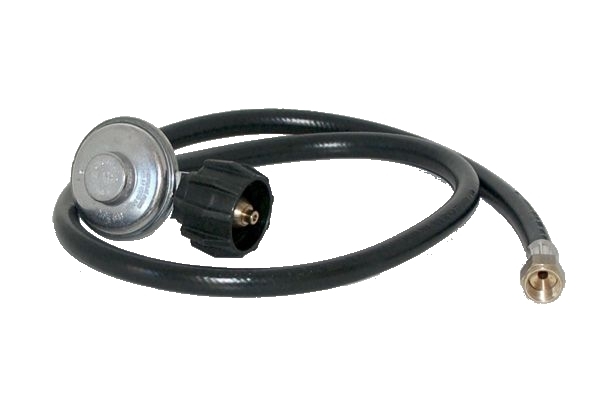 The most common type of regulator used on outdoor gas grills is the single, type 1 regulator that we sell. It is also known as a compact regulator because it reduces the pressure of the liquid propane to about an 11″ water column measurement all in one stage. We have had many customers use our regulators for their Bakers and Chefs grills. As far as I can tell, a 2 stage regulator system is used when gas is coming from a residential tank that needs a regulator at the point the gas leaves the large tank and then another regulator down the line at the point of whatever appliance is being fueled. There are also 2 stage regulators that are made for appliances that need a very exact water column measurement. Gas grills are not that exact and you can save some money using a compact regulator instead. If the regulator you receive doesn’t work or looks specifically different from your original, or you have any other concerns, just give us a call and we can help you troubleshoot it further!! A plumber is switching over my grill from LP – NG I have one propane tank by the grill part that is 60 BTU’s total for the rotesserie and such and then I have the griddle and burners that are a total of 29,000.l Do I use the connectors that say up to 60,000 or the hose connect kit that says up to 170,000 BTU’s for multiple. I’m so confused and is there anything else that I need to know? Without seeing your exact set-up, it’s hard to say which parts you need. If you have two separate lines feeding the grill, you will also need two lines for the NG supply. That is, unless your plumber is planning to pull them into one hose with a special connector. If your plumber is just using whatever parts you provide to connect the pieces, I’d suggest you reconsider altering the grill. Gas conversions are a very specific science. You either need new valves, or a kit from your manufacturer, or a grill-knowledgeable plumber who knows how to safely and accurately alter the valves inside your grill. If your plumber doesn’t know what is needed, I’d find a new plumber or use LP. I have A Jenn-Air 720-0100NG grill. I need to replace the regulator and hoses. Is this something that you have that will work with my grill?Thanks in advance for any help. Thanks for your question! Unfortunately we do not have the type of regulator your Jenn-Air takes. This model happens to require a fairly unique regulator. You can purchase one through Nexgrill, Jenn-Air’s parent company, at http://shopnexgrill.com/. I’m looking for the correct replacement for a regulator and hose for a Members Mark Model Y0660LP. The Members Mark Manual Parts section calls for a part number P3632K and I’m not sure which part number you use as a direct replacement. The regulator and hose that you have that is the closest in length is the HR6 Hi flow regulator. Is this the one I need to order? The HR6 will work out fine for your grill. You can order by calling us at 877-244-0737 or you can order online. Hi Doug, Happy Independence Day! The inside of the valve has holes that are also drilled to exact measurements for your natural gas grill. You would need to replace the entire valve, and we would suggest getting the exact fit replacement. Try contacting Sunbeam directly and see if they still carry parts for that model. Good Luck!! I have a Jenn-air model 730-0339 and I want to convert it from natural gas to propane. I cannot seem to find any fittings to do so. Is there a way this conversion can be made? If so, what is that conversion? I am okay with changing anything I need to make it work safely. There is not a conversion kit currently available for that model. 🙁 Some folks have tried using conversion kits for other models, and we would advise against this for safety reasons. Thanks for the great question, and happy grilling!! Mike, it sounds like the best thing for you to do is talk with someone about the exact issues you’re having. Try emailing customer service at info@grillpartssearch.com or calling 877-244-0737. Thanks!! I have a Brinkmann 8410. I need a new regulator hose assembly and cannot find one that has 3 hoses. It is model number RA320-Y. it is 28 inch size 5/16 inch end fitting 2×5/8-18UNF. I really can’t afford to buy a new grill. Please help me. Connie, thanks for your question! We do not at this time sell a regulator with three hoses. Have you tried Brinkmann.net? Thanks for the question. Call our customer service reps at 877-244-0737 with your model number. Tell them the Grill Girl sent you and if they don’t have the part you need, they will find somewhere that does. We can help you find that part. Just give us a call 877-244-0737! I have a Grill Master model# 720-0737 which seems a little on the low temp side. The flame on the burners looks correct (gas /air mixture) as well the valves seem to be functioning correctly (no binding in any way). I would like to replace the regulator and i am going to a 40 pound tank so i will need a longer hose. I would appreciate any recommendations that you could give me on the correct size regulator and hose…Hopefully get a little more heat out of this grill!!! I would like to get a rotisserie for it as well and again i would appreciate any recommendations there as well!! I turned my grill on for the 1st time this year fired it up and everything was perfect… When it came time to use it that afternoon, I heard a loud hiss and the flames on all my burners was extremely high! Is it time for a new regulator? Wow, that sounds scary! Usually regulators go bad and close down over time to prevent something like that from happening! You could try replacing the regulator first. That might fix the problem and it’s the cheapest and easiest thing to try. However, even after you get a new regulator, when you light up the grill again, I would recommend watching it for a few minutes to see if it behaves itself! I have a Jenn Air model 720-337 LP gas grill with 4 burners and a side burner. The last two weeks I have started having a problem where the burners light fine and seem to burn properly, low or high, until I light the 4th burner. It doesn’t make any difference which burners are lit or in what order they are lit. As soon as the 4th burner is lit, they all go out or almost out and sputtering. Turning off the 4th, 3rd, 2nd or 1st burner does not relight the burners.. Have to shut them all off and then turn back on to relight it. I have cleaned the burners, Changed LP Gas tank, eliminated the pressure gauge between the regulator and the tank and have checked the hoses for kinks or leaks. Do I need to change the hoses and regulator? Do you have the correct hoses and regulator for the grill? I have a BBQ Grillware natural gas grill that I want to convert too propane. Is there a conversion kit on the market to do this??? The model is a GSC2418N. Great question! There’s a lot of bad information out there about converting gas grills. The truth is you need to alter the valves. What most people don’t know is that you cannot simply change the valve orifice. The inside of each valve (the valve core) is also drilled to work with either liquid propane OR natural gas. That being said, you need a smaller hole for liquid propane than natural gas, so you can’t alter your current valves to work with LP. Unfortunately, I do not know of a kit for the GSC2418. You could try contacting the manufacturer directly. If there is a model that was the same make as your grill, but made for LP, you might be able to track down replacement valves for that grill, and use them in your grill. Good Luck! Charmglow Grill….On screwing regulator hose back on Grill Butane is coming from leak between knob you turn and butane tank…I assume the hose and regulator need to be peplaced..
At this time, we do not sell parts for conversions. Sorry about that! I have a small hose with 2 female connections it go to the side burner on a charmglow 810-8500 I checked 5 different cg dealers and none have it or have not even heard of it what gives? Unfortunately, we do not sell that part either. The Brinkmann corporation is the manufacturer of your Charmglow grill – maybe you can contact them for that part. Good luck! Good morning. I have a Sterling Forge model 720-0058-LP gas propane grille which I think the regulator is bad. Could you recommend the replacement part number and price so I can order one? It looks like you have a 4-burner grill that uses cast iron rail type burners. I would suggest the Hi-Flow regulator for that grill. As long as you only need one hose, the HR6: http://grillpartssearch.com/product/HR6.html should work really well! My Church, the Refuge, has a donated Charmglow mod# 720 0036-HD and needs a new regulator. Do you have it and what would u charge including tax, shipping & handling to broomfield, co.
One of our members has a low flow regulator that is probably OK, would that work? I need a regulator for a thermos grill to go. Is there any other regulator that will work. In most cases, it’s easier and safer to simply replace the entire unit. A regulator assembly should run between $20 and $30 and come clamped to the hose with all the gaskets and fitting needed. It would be my suggestion to just buy an entirely new one. Can u use the same regulator for propane gas and natural gas? I have two tanks. One tank expired and we got a new one. When I tried the new tank, it leaked. It blows gas out the connection between the tank and regulator. I switched back to my old tank and had no leak. Are the tanks different? Do I need a new regulator? I hope this helps, but please let me know if you have any other questions about grilling! do you have video on how to replace a connector kit? Here’s another post about how to remove the regulator from a Charmglow grill. I hope it helps with your question but please let me know if you need to know anything else! Thanks again and enjoy the warmer weather. Hope you get some good grilling in!